This bumper replaces your Land Rover Discovery I OEM bumper with the welded strength of structural steel. Price shown is for the base bumper and from there, is fully customizable so that you can include the best options that are important to you. Comes standard in a black satin finish. This stylish, all steel construction winch bumper has been designed to improve your off-road performance capabilities while still supporting various multicarrier options such as tow points, tire carrier, gas cans, backup lights and more. All welds are ground and finished to give a professional, high quality appearance. Made with the highest quality standards by experienced craftsman using the latest technologies. Our bumpers are 100% made in the USA with by American craftsman and materials! your order with seperate invoice for shipping. As a reference, LTL shipping fees usually range from $150-$250 depending on weight, configuration, residential or business destination, and distance. Local pickup in Atlanta is available at no charge. Note 2: Some bumpers may require minor welding or modifications, due to variations in some makes and models or fit and finish. Most will bolt right in, but some will require some minor modificatios. 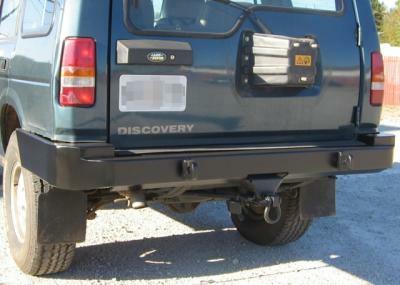 We reccomend your new high-strength steel bumper be installed by a qualified technician.